Tiffany is twisting and turning and her mind won’t stop whirring, she just can’t fall asleep! As a fairy tale enthusiast she knows that the only thing that keeps people awake is a PEA hidden underneath her bed. Join Tiffany as she adventures down through the mattress worlds, helping the bed folk that she meets along her adventure. But look out Tiffany, the further down you go the closer you get to the monster that lives under the bed! 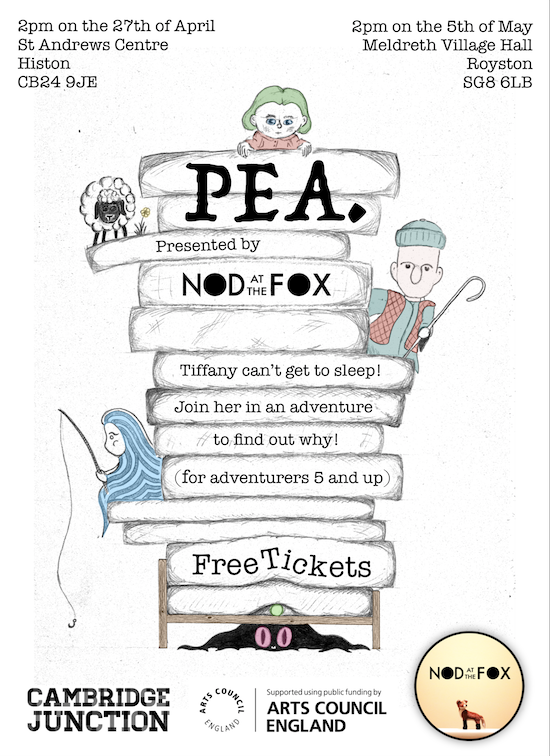 Come along to the St Andrews Center in Histon on Saturday the 27th of April to enjoy a magical performance of 'PEA'. with puppets and music and lots and lots of sheep! The performance is at 14:10, doors opening at 14:00, and will last about 50 minutes, though we'd love you to stay for a bit afterwards to have a play with the puppets and give us some feedback. Hope to see you there for this epic adventure!